Many people love the sunshine and hot temperatures of summer, but sunburn, sweat-inducing humidity and mosquitos aren’t for everyone. If you want to escape the sweltering heat, these amazing vacation destinations that stay cool all summer long are for you. There are many reasons to love Nova Scotia – the breathtaking scenery, the fresh, delicious seafood, friendly residents – and, the summer temperatures with highs typically a bit over 70 degrees and lows in the mid-50s. Cape Breton offers an especially idyllic summer escape with its spectacular natural beauty, gorgeous beaches, live traditional Celtic music every night and the chance to enjoy watching whales, dolphins, seals, puffins, bald eagles and more. Seafood in this province is particularly renowned, and, whatever is on your plate for dinner was likely taken out of the North Atlantic’s cold waters that very morning. 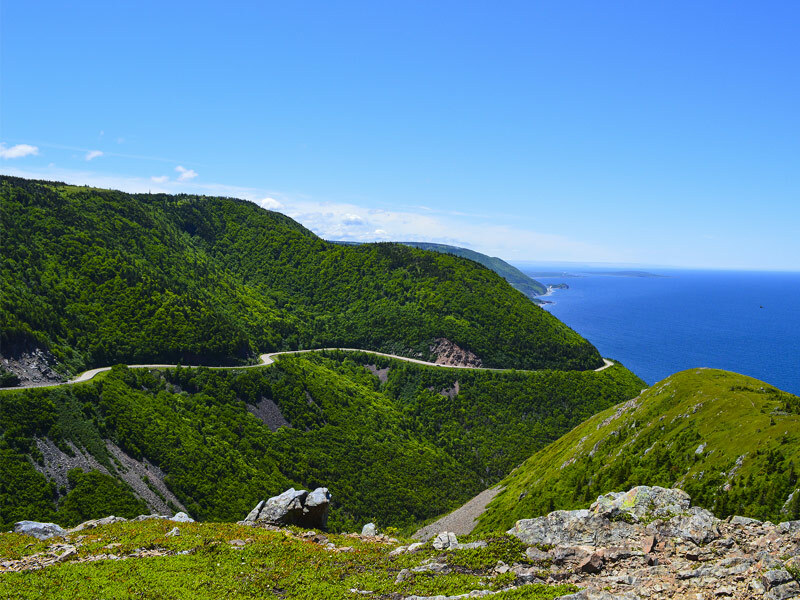 If you have time, be sure to take the scenic 185-mile drive on the Cabot Trail, a stretch of road that winds along the ocean-side cliffs. 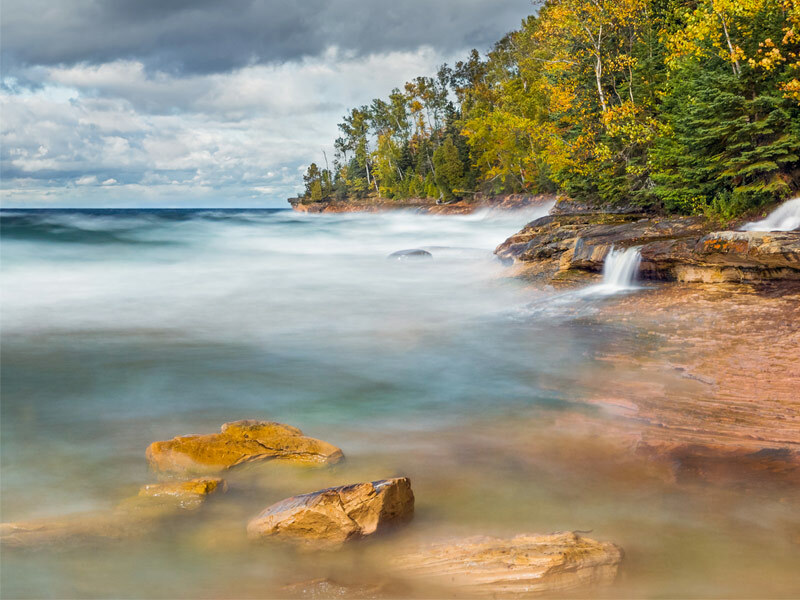 If you enjoy taking quiet strolls along moss covered paths, the thundering sound of falling water across a vivid blue lake and scenic landscapes, Michigan’s Upper Peninsula, a favorite heartland getaway, may be calling. You’ll feel as if you’re worlds away from the chaos of urban and suburban life, and you won’t be suffering from summer’s extreme heat either. Daytime highs tend to be around 75, and the evenings, with lows in the high 50s, are perfect for gathering around a fire. This is a stunning, if often overlooked, vacation destination that draws families with its forests, lakes, falls and heatwave-beating chill. Located on Iceberg Alley, Twillingate is not only the province’s ultimate adventure destination as an ocean playground with a rugged coastline, icebergs, whale and unique island culture, but high summer temps average just 71 degrees, with lows averaging 58. If you want a place to escape the heat every year, you can actually buy a home here for less than what it would cost to rent a similar place in the Hamptons for only a week. 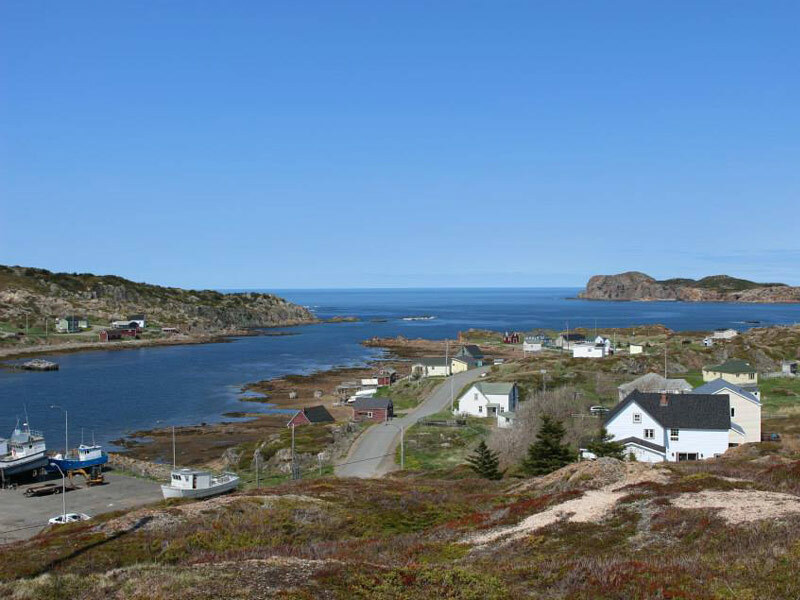 This end-of-the-word fishing village is surrounded by miles of hiking trails and picturesque lighthouses as well as offering the chance to watch icebergs float by from May through July. Get out on the water during the summer, by taking a boat or kayak tour, and watch for a variety of marine life, including humpback whales. Wine enthusiasts will be happy to find that it’s even home to Auk Island Winery, with tours and tastings available. 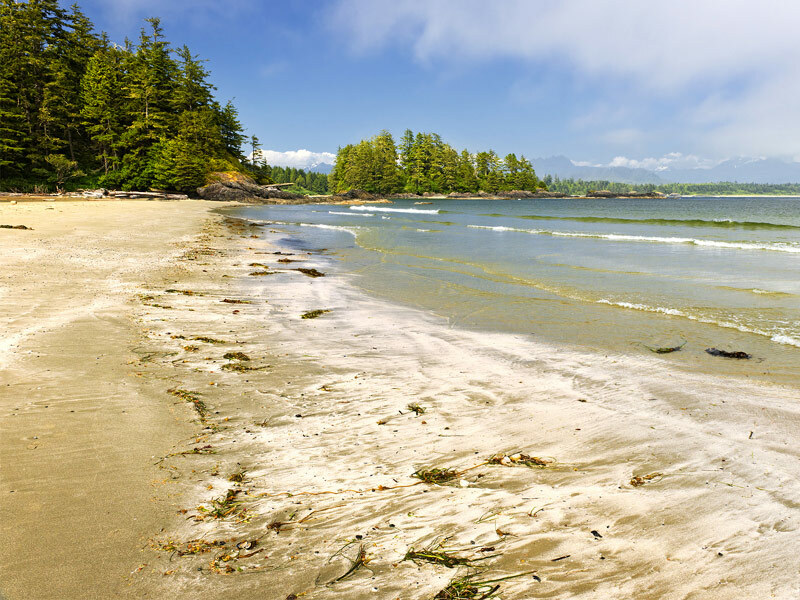 Vancouver Island doesn’t offer a tropical escape, it’s actually set in one of only seven temperate rainforest ecosystems in the world, with summer temperatures in the high 60s and low 70s. Of course, that makes for comfortable outdoor excursions, and the opportunities are numerous. Not only is the island home to some of the most magnificent landscapes on earth, from the open sea and calm inland waters to lush, towering mountains and rain forest, you’ll also have the chance to participate in all sorts of activities, from kayaking, surfing and sailing to hiking, biking, bird watching and even golfing at world-class championship courses. 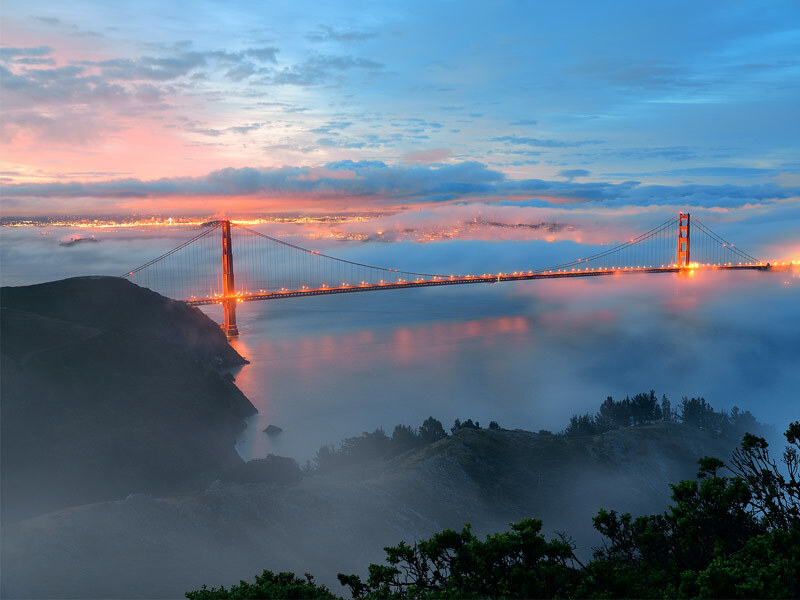 Locals and visitors alike appreciate the beauty of California’s breathtaking City by the Bay – and, here, the average summer temperature is a cozy 67 degrees. If the weather gets too chilly, you can enjoy lots of indoor activities, like visiting the Cable Car Museum, driving across the Golden Gate Bridge and on Lombard Street, the most crooked street in the world, as well as exploring the California Academy of Sciences, one of the largest, most innovative and most eco-friendly natural history museums on the planet. When the weather is pleasant, you might hop on the ferry to Alcatraz for a tour of this legendary, haunted prison, enjoy people watching while walking the Haight-Ashbury District and visiting the zoo. No matter what the weather, don’t miss the sourdough bread soup bowls, served at Fisherman’s Wharf and other locations throughout the city. No matter where you are in Ireland, odds are, you won’t have to deal with searing heat. The average summer temperature throughout most of the country is 60 degrees in the summertime. Just pack an umbrella or a rain jacket for those misty mornings and you can enjoy walks among some of the most magnificent scenery on earth in places like Wicklow National Park. 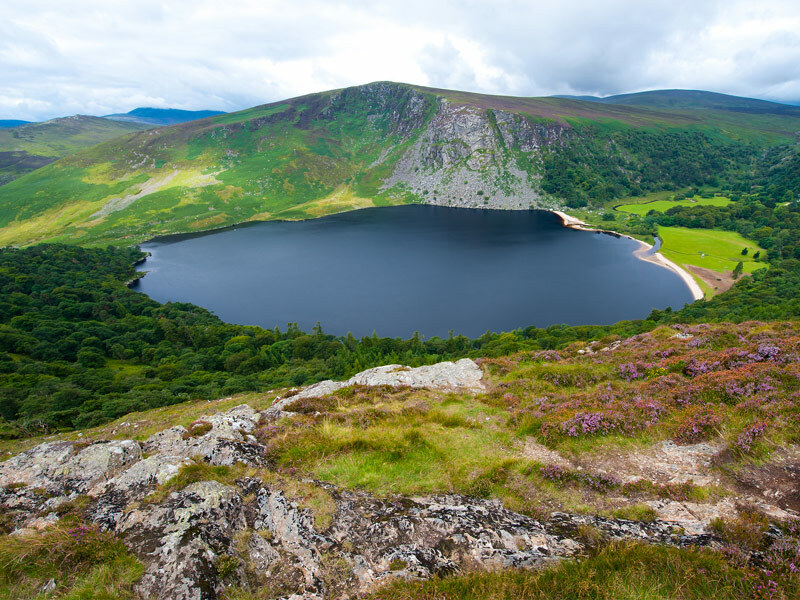 The Lough Tay to Lough Dan walk is especially stunning, with gorgeous views of the towering Luggala Mountains, peaceful rivers and brilliant emerald green hues just about everywhere you look. Both lakes have been the setting of scenes in a number of films and TV shows, including the History Channel’s “Vikings,” and the Irish television series, “Ballykissangel.” This is also the season when heather is in bloom, and you can see a sea of purple and maroon across the hills and fields of bog cotton that covers the landscape. Of course, you can also enjoy out-of-this-world, postcard-perfect coastal scenery in places like Dingle and Portmagee in County Kerry too. The average summer temperature in Scotland is just 59 degrees. Visit Edinburgh, home to lots of great outdoor festivals, like the Mela Festival, which celebrates the diverse culture through arts, crafts, food and performances, as well as Edinburgh Castle, a historic fortress that dominates the skyline of the city, open for public tours. You might want to head out to more remote areas where you can enjoy some of the country’s most beautiful scenery, like the Isle of Harris, the largest island in the Outer Hebrides. 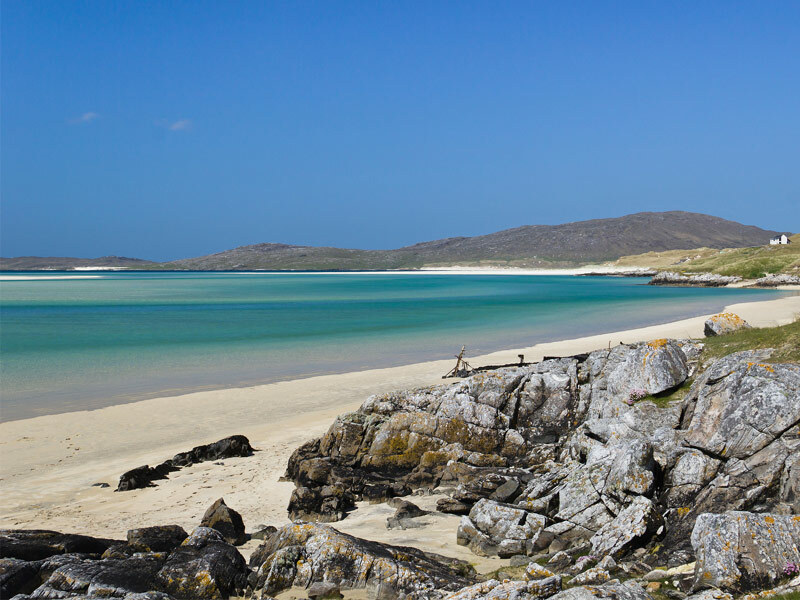 The southern, and more mountainous part of Lewis and Harris, it’s home to Luskentyre Beach, one of the most picturesque beaches on the planet, with miles and miles of pristine, white sand and stunning blue-green water. The Isle of Skye, the second-largest of the country’s islands, is a 50-mile-long patchwork of unique geologic formations, jagged mountains, glistening lochs and soaring sea cliffs. You’ll also find numerous trails for exploring it, lots of castles, a whisky distillery, cozy pubs and crofting museums. 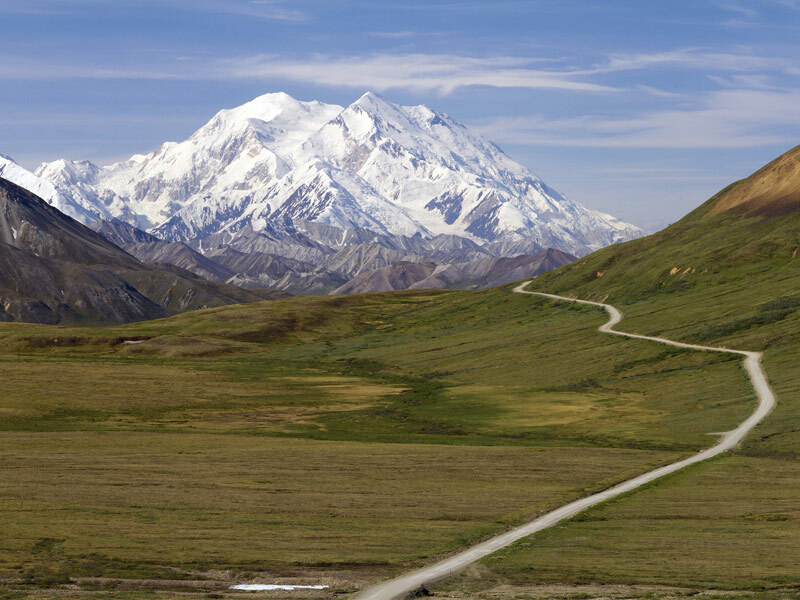 Denali National Park not only offers comfortable temperatures that average around 66 during the day and 44 at night during the summer, but the chance to get out and hike a multitude of trails to take in jaw-dropping mountain views. The Horseshoe Lake Trail is one of many, winding 1.5 miles through spruce and aspen forests to beautiful Horseshoe Lake. The crisp air feels more like spring than summer, and Mount McKinley, the continent’s highest peak draws climbers from across the globe, but you don’t have to climb the mountain to experience it. Although mountaineering is a popular activity, flightseeing is another great option, or you can also take in the view from a number of scenic overlooks. This is also the time of year that this area becomes a wildlife showcase, with animals raising their young and engaging in preparations for the return of cold weather. Many different animals can be spotted, including the “Big Five,” grizzly bear, wolves, moose, caribou and Dall sheep. You can also glimpse martens, lynx, beavers and fox. Stockholm, spread across 14 islands, is a mild 72 degrees on average during the summer. While you won’t sizzle in the heat, you can still enjoy swimming in freshwater, as well as sailing between the islands that overlook the Baltic Sea to the east. 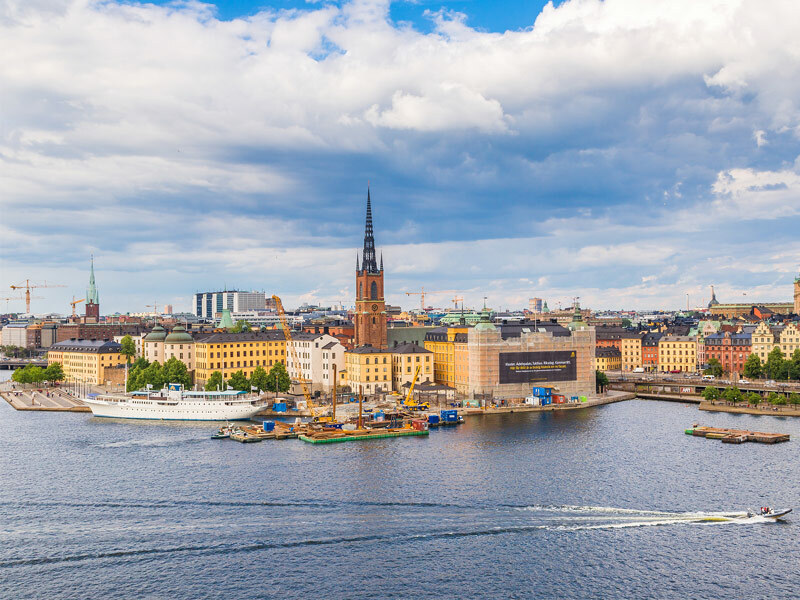 Enjoy fresh, incredibly delicious fish at Nystekt Strömmingvagnen, explore medieval history in the old town, Gamla Stan, and taking in the sweeping, panoramic vistas of Stockholm from City Hall Tower. Skansen Open-Air Museum, a fun and family-friendly museum on the leafy island of Djurgarden, is a bit like Swedish Colonial Williamsburg. It hosts all types of exhibits, with people in period costumes demonstrating crafts and bygone waves of life. It also hosts a zoo area where you can watch animals like wolverines, moose, bears and seals. Olympic National Park is home to one of the largest temperate rainforests in the U.S. It also happens to be one of the chilliest spots in the country during the summer, with temperatures hovering around a pleasant 67 degrees during the day and dropping to a little over 50 at night. Take a drive up to Hurricane Ridge, one of the park’s many dramatic sights, and you can look down to San Juan de Fuca Strait out to the San Juan Islands and Vancouver Island in British Columbia. 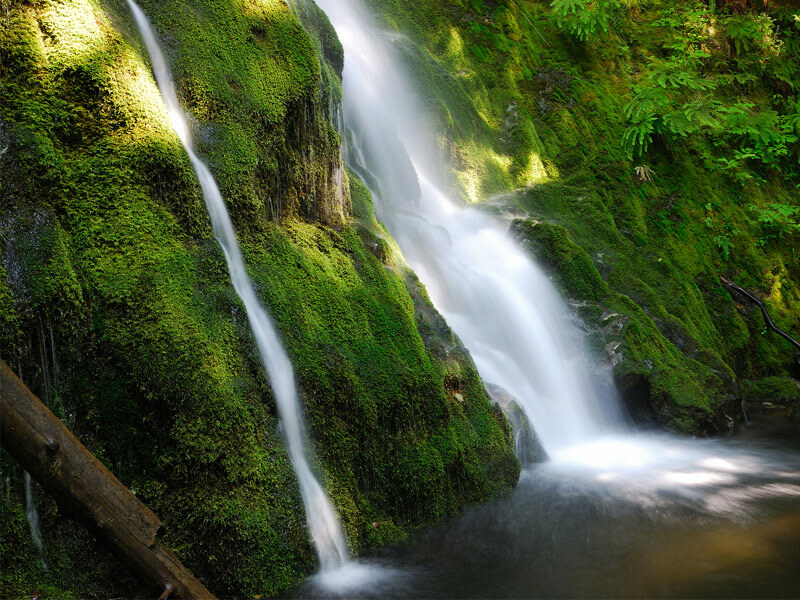 Just a bit further west, Lake Crescent is a breathtaking gem, filled with emerald-hued waters that are surrounded by lush greenery and a multitude of cascading falls. On the west coast, you’ll discover wild, beautiful beaches that offer great beach combing as well as the chance to peer into tide pools, filled with starfish, hermit crabs and other sea creatures. Summer in Norway means long days, and more sun for taking in the jaw-dropping views of striking blue fjords and white-peaked mountains, though you’ll never be uncomfortably warm, with average temperatures in the mid-60s. In the picturesque capital city of Oslo, you’ll find lots of interesting attractions along with world-class art galleries and museums. After dark, experience the city’s lively nightlife, with options including everything from the opera to live indie rock bands. 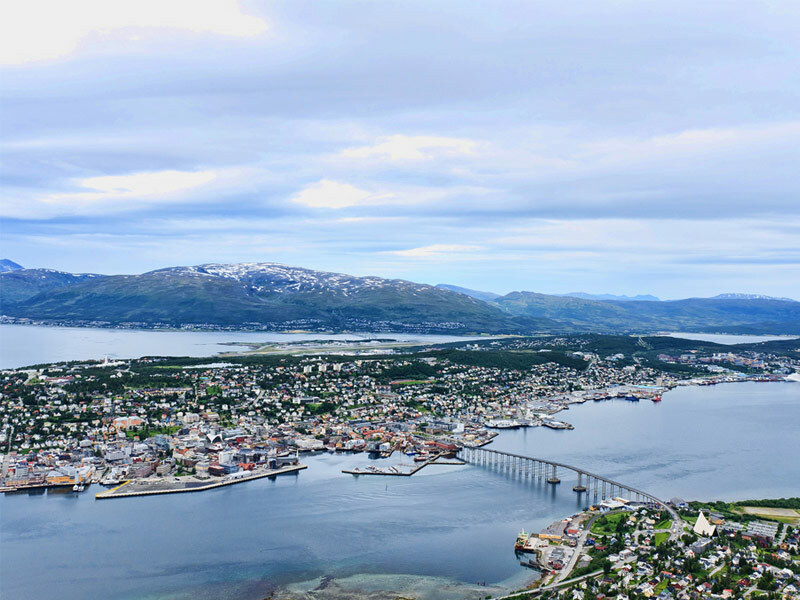 Tromso, Northern Norway’s largest city, is known as the “capital of the Arctic, internationally renowned for its large number of 18th-century wooden and the incredibly beauty of its natural surroundings. Located nearly 220 miles north of the Arctic Circle, you’ll certainly keep cool here. Be sure to explore the Polar Museum and arctic aquarium, as the well taking the trek up Storsteinen Mountain by cable car where you can enjoy more impressive mountain and fjord views. The northern locale of Acadia National Park just about guarantees a comfy summer with highs in the upper 70s and lows around 59 degrees. The climate is ideal for enjoying the great outdoors, whether you’re relaxing on Sand Beach or hiking up Cadillac Mountain. This stunning national treasure is a magnificent meeting of mountains and sea, comprising more than 35,000 acres of land on Mount Desert Island, Isle au Haut and the Schoodic Peninsula. 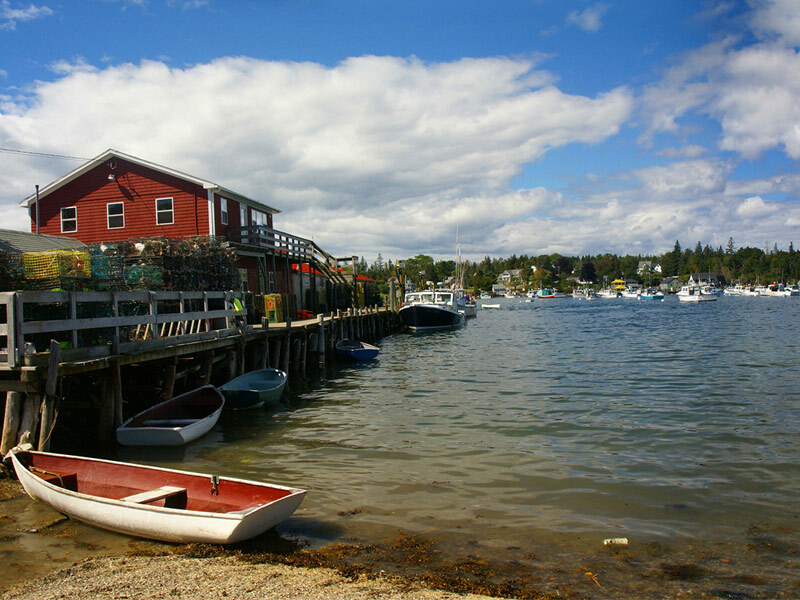 You can see all of Maine’s quintessential features right here, including tranquil ponds, forests, mountains and the rocky coastline. Wildlife watching includes the chance to glimpse moose, foxes, peregrine falcons, herons, seals and whales. Banff National Park is not only one of the most breathtaking places on earth, it offers cool temps with highs around 72 and lows in the upper 40s. If you’re looking for a mountain retreat with mild weather, fishing, hiking and mountain biking, this is your spot. 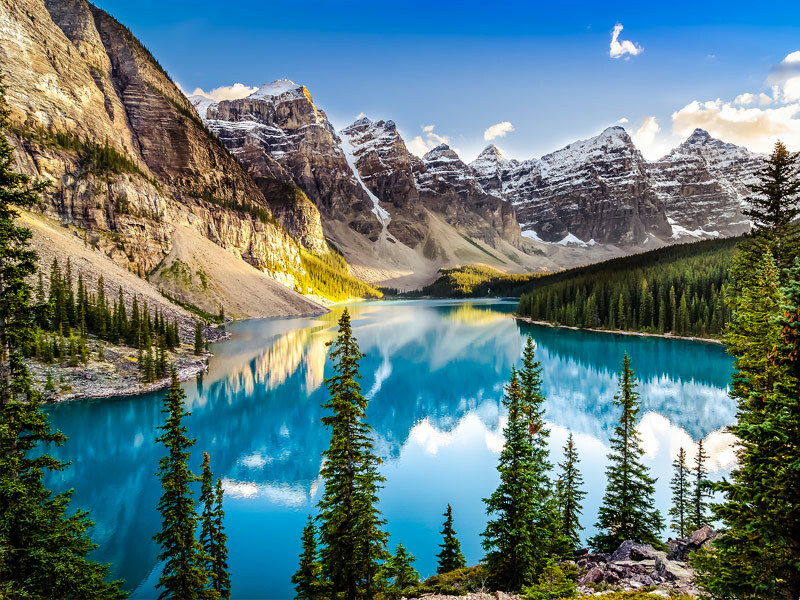 Banff itself offers lots of small town charms as well as making a great base for exploring the gorgeous glacier-fed lakes and multitude of wildlife. It even boasts a thriving arts and culture scene with a number of museums, art galleries and concert venues along with a diverse array of fine restaurants and shops. See the scenery and wildlife on what National Geographic has called a “Drive of a Lifetime,” the 142-mile Icefields Parkway. It traces the Continental Divide and connects two national parks, Banff and Jasper, as well as Lake Louise and Jasper. Taking the eight-minute ride to the top of 7,500-foot Sulphur Mountain from Banff provides panoramic views of the park. You’ll also enjoy the long days of summer in Iceland, which means plenty of time for hiking, horseback riding, kayaking and other outdoor adventures. 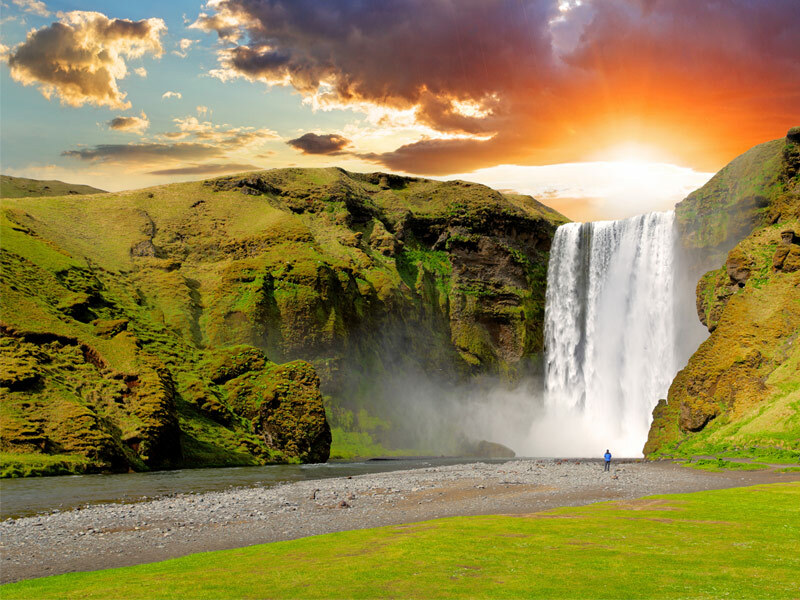 Be sure to visit Skogafoss Waterfall, one of the country’s largest and most famous falls, plunging nearly 60 feet into a pool below. As the high volume of water flows, it produces a thundering sound along with a rainbow-yielding mist that makes it a photographer’s dream on a sunny day. Strokkur geyser is another must-see. It sits in the middle of a geothermal field, surrounded by bubbling springs in Thingvellir National Park, erupting once every four to eight minutes, and getting as high as 65 feet. Of course, an Iceland vacation isn’t complete without visiting the Blue Lagoon, where you can soak in the cobalt geothermal water and even sip on a blue lagoon cocktail from the LAVA bar, without having to leave the warm, healing waters. As Easter Island is in the Southern Hemisphere, the months of June, July and August are actually wintertime here, though high temperatures average in the mid-60s, and lows aren’t that much different, hovering a little over 60 degrees. While there are many reasons to visit, the island’s fascinating history is arguably No. 1. 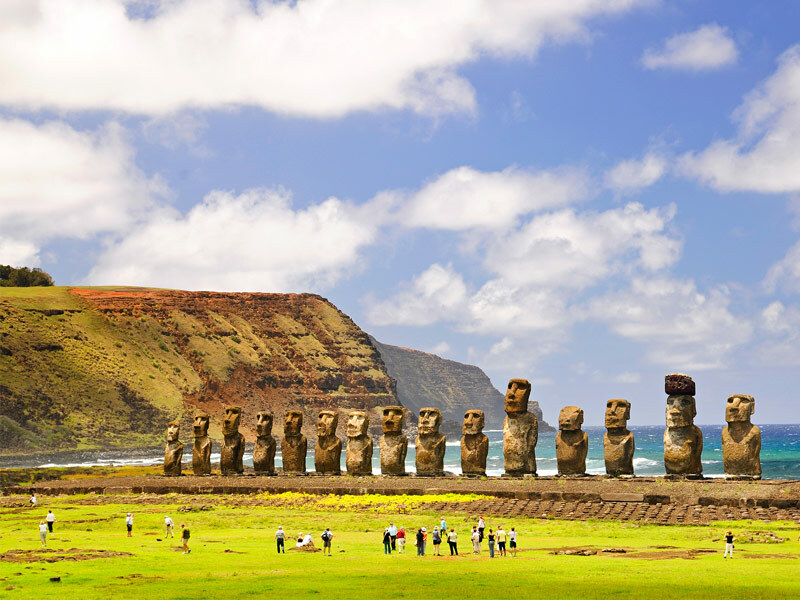 Over 1,000 years ago, a group of Polynesians loaded into canoes and found their way across the South Pacific to this remote island and began to create nearly 900 long-faced statues, called moais, which represented their ancestors. Many were hauled for miles, with the most impressive display found along a beach known as Tongariki, where 15 imposing figures stare in the distance as the surf pounds behind them. You can walk in the footsteps of the ancient people who lugged these 20-ton monoliths as well as ride on horseback to see the stone faces up close. This island that’s part of the South Georgia and the South Sandwich Islands as British territories, are set in the South Atlantic between South America and Antarctica. As one of the most remote spots in the world, it’s only accessible by sea as there is no airstrip. The surrounding waters are extremely rich with marine life, home to an abundance of seals, seabirds and penguins. Other than the extraordinary wildlife, the island is home only to a postmaster, a British Government Office, some museum staff and scientists. 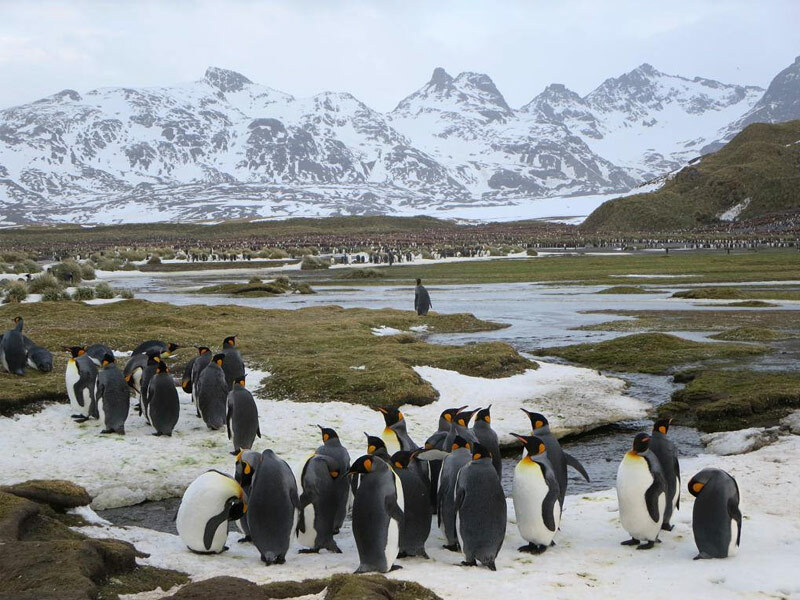 If you go, be sure to get your passport stamped with the official “South Georgia” stamp, become immersed in the sea of king penguins on the vast expanse of Salisbury Plain and follow the footsteps of Sir Ernest Shackleton. Shackleton landed here and traversed the mountains to finally get help for his men after they’d been stranded for many months after their ship became trapped in ice. He died just off the South Georgia coast during a later expedition, and his body was later returned to be buried here. July is in the middle of winter in New Zealand, offering a perfect way to cool off while enjoying some of the country’s amazing outdoor activities. 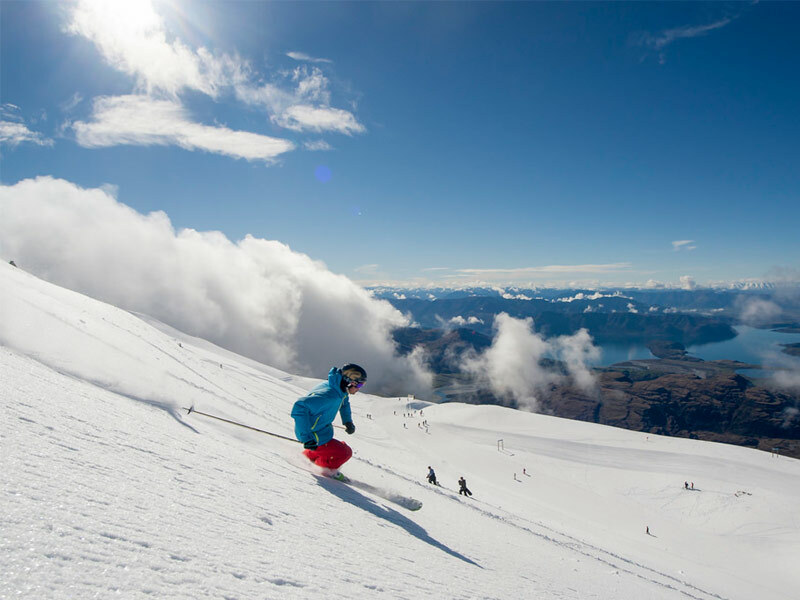 Its slopes are legendary, with the South Island boasting the most ski resorts, though the North Island is home to New Zealand’s only skiable volcano, Mt Ruapehu. You can also enjoy soaking in natural hot springs – they’re all over the place, including Tekapo Springs that offers stunning views of Lake Tekapo and the snow-covered Southern Alps. June and July is also the best time to go whale watching, with the opportunity to spot a humpback, blue or southern right whale at Kaikoura, and they’re often seen closer to shore in winter than at any other time. If you’re worried about getting too cold, consider the average winter temperature at the Bay of Islands, along the east coast of the North Island, is a rather balmy 61 degrees. June, July and August are great months to visit South Africa, with the country experiencing winter during this time of year. Average highs are 68, while lows are in the upper 30s. At Kruger National Park, you can enjoy a comfortable safari with the chance to view the greatest variety of wildlife on the continent. 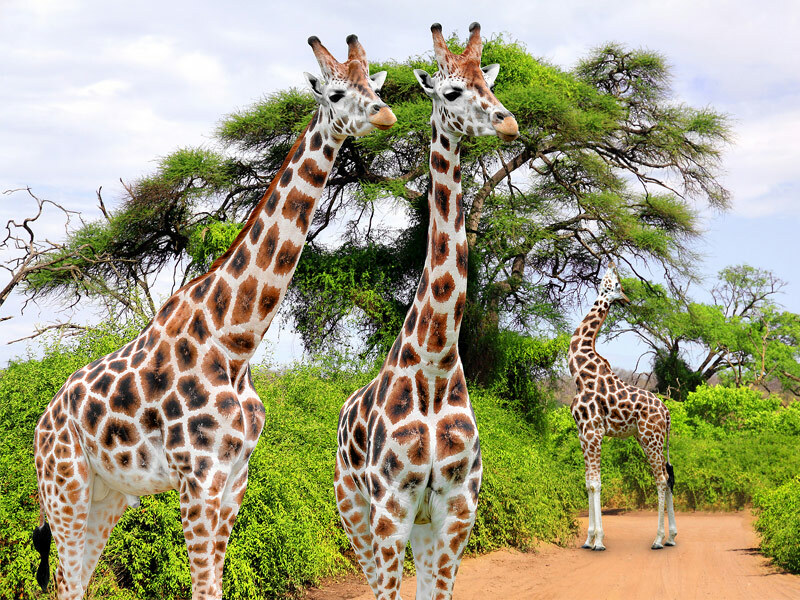 The park is home to 145 mammal species, including Africa’s Big Five and an amazing array of other creatures, including everything from hippos and crocs to giraffes, wild dogs and cheetahs. It’s also one of the best maintained parks in Africa, making it ideal for a more affordable, easily accessible self-drive safari. July is the hottest month in Copenhagen, and high temps average just 63 degrees. 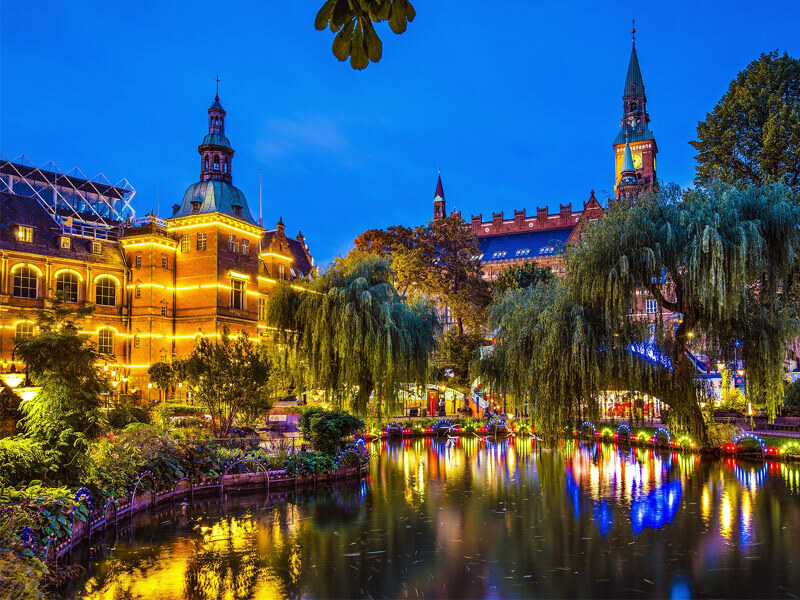 Tivoli Gardens offers a fabulous summer refuge where concerts draw crowds to an open-air stage set beside a rose-filled garden. Explore the Danish Riviera, just north of the city and discover pristine beaches along with a fun holiday atmosphere, museums and castles. The island of Funen, also near Copenhagen, was the birthplace of Hans Christian Andersen and is home to colorful public gardens, castles and manor houses. The even cooler Aalborg, in North Jutland, is home to Legoland in Billund, while Aarhus, situated along the coast next to fjords and forests as well as Viking rune stones, features an Old Town that displays traditional Danish architecture from the 16th to 19th century. If you really want an adventure, you can fly direct to Greenland from Denmark and go glacier skiing. 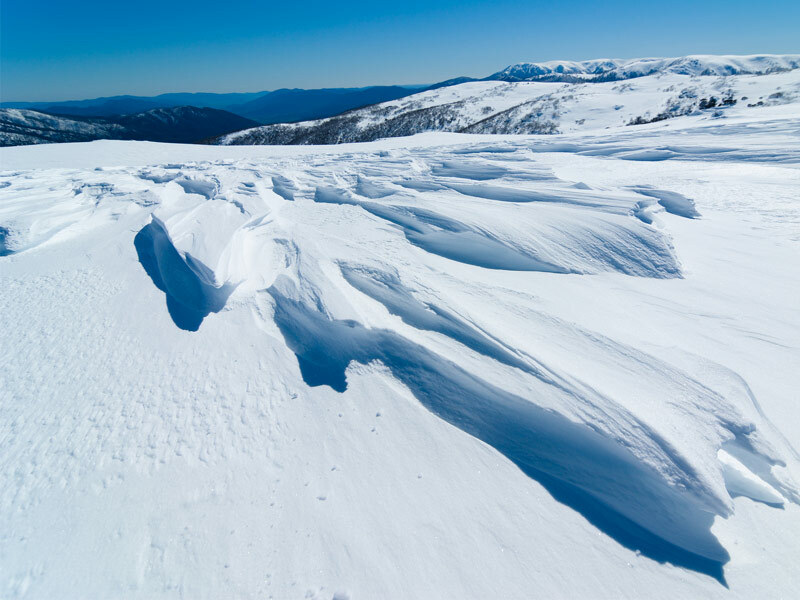 Australia isn’t exactly famous for its ski scene, but at Falls Creek, an Australian Alps ski resort in Victoria, you can enjoy skiing in June, July and August. Falls Creek ski village is easy to access, located about 220 miles from Melbourne, and offers pleasantly cool, rarely freezing temperatures in the region’s lower elevations during the winter months. When in Melbourne, Australia’s second most populous city, you’ll have the opportunity to enjoy this mecca for shopping and fine cuisine too. Its galleries, theaters, shops and restaurants offer a distinctly European feel, with shoppers flocking to the elegant Royal Arcade on Bourke Street, Chapel Street and the Melbourne Central Shopping Center as well as Queen Victoria Market, which has been selling produce, clothes and crafts for over a century. The Patagonian region of Argentina not only offers some of the most breathtaking scenery on the planet, its home to the charming town of Bariloche, located near some of Argentina’s best ski slopes, including the Cerro Catedral ski area, one of the biggest on the continent with over 60 miles of runs, providing another great destination for skiing during America’s summer months. Even if you aren’t into the sport, you’ll have lots to do here. 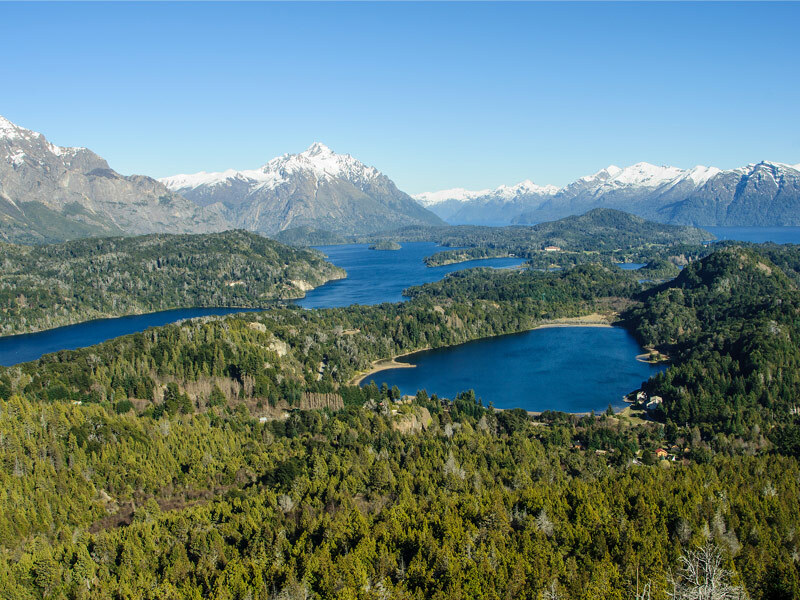 Bariloche offers a unique atmosphere that’s been compared to some of the most picturesque towns in the central European Alps. When the town was first settled over a hundred years ago, most residents were immigrants from German-speaking countries like Germany, Switzerland and Austria, with architecture resembling their homeland. It also happens to be filled with delectable chocolate shops, breweries, and even the occasional Saint Bernard.